Thinking Pinoy: #OustDuterte: Daddy D worries about a 1st Quarter Ouster Plot? #OustDuterte: Daddy D worries about a 1st Quarter Ouster Plot? My friend Mocha Uson was kind enough to make me her plus-one when she attended the Malacañang Christmas Party held yesterday, December 20th. She and the Mocha Girls were invited to perform in the event. I went there as Mocha’s friend and not as ThinkingPinoy, so I took off my TP hat and watched everything from the point of view of an innocent bystander. Unencumbered by the need to write anything about the event, I was able to observe everything that went on. The president arrived a couple of hours into the party, accompanied by his wife Honeylet Avanceña and his daughter Kitty, plus the usual horde that is the Presidential Security Group. As he was walking towards the venue, I noticed something different in him. I have personally seen the President on many occasions, starting in 2010 when I was still a budding journalist in SunStar Davao. I have also seen him in action in Beijing and in Singapore. He’s usually very accommodating and personable. His penchant for cracking jokes to lighten everyone’s mood has even gotten him into a bit of trouble [TP:Le-Knee]. This time, however, the usually jovial President was in a pretty bad mood. He wasn’t cranky or anything of that sort, but he wasn’t as outgoing as he is known to be. This time, however, I felt like something’s off. There’s something in the back of that old man’s mind. Something that pisses him off enough that it actually showed. His speech contained the usual elements that even I admit are starting to get old. There’s the advocacy for Federalism vis-à-vis the historical injustices against the Moro People. There’s the human rights issues vis-à-vis the war on drugs. The whole nine yards. He delved on the ouster issue for several minutes, suggesting that there may indeed be a real threat looming in the horizon. But I have my own Plan B: I consulted with those who are in-the-know. I have managed to gain over 350,000 social media followers in the past year, some of whom happen to be occupying important positions in the government. Specifically, I have become acquainted with top-tier government officials who are more than willing to provide me with leads. And a lead is what I got, and I got it from two unrelated sources: one is a high-ranking military official (MO), and the other is a high-profile legal counsel (LG). 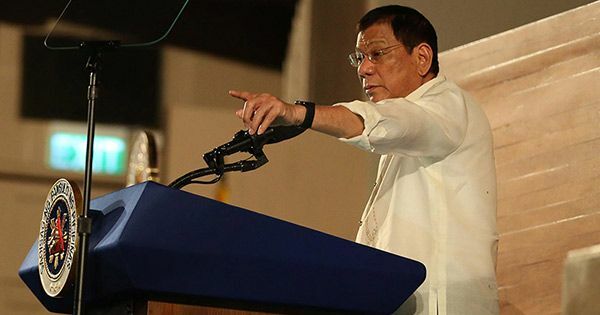 Both sources told me on separate occasions that an influential religious group (IRG), widely believed to support Duterte, is actually hedging its bets because it wants to protect a member who happens to be drug-linked police general. MO and LG said IRG also indoctrinated a high-profile Bilibid inmate, whose anger at Sen. Leila De Lima stems her extorting drug money not only to fund her senatorial candidacy but also to fund her lavish lifestyle. This is the same reason why de Lima was able to give Dayan a relatively ostentatious residence. Both MO and LG independently confirmed to me that it’s not just Leila: many members of the Liberal Party are on the take. Now, I am very careful when it comes to analyzing such information because of potential dezinformatsiya, or the tactic of disinformation aimed at undermining the official version of events [NYTimes]. In colloquial Tagalog, the intel community calls it “nangunguryente”. However, I have reason to believe that at least one thing is true: that IRG has an interest in the illegal drug trade, as it’s the common denominator I got from my two sources. That’s the lead I needed. The War on Drugs is the root cause of LP’s bid for Duterte ouster. With the drug war, Duterte stepped on the foot of powerful people and organizations who benefit, whether directly or indirectly, from the illegal drug trade. These includes not only those who trade illegal drugs, but also those who receive the illegal drug largesse. As discussed earlier, Influential Religious Group (IRG) benefits from drug trade, but this kind of news is not really new, as it has been documented before in other countries with serious drug problems. Narcolimosnas, or the flow of illegal drug profits to religious institutions in the form of charitable donations, is a widespread practice in areas like Mexico, where drug cartels thrive [ElPaso]. But it doesn’t end there. Narcolimosnas may actually be used for money laundering, with the US Government itself pleading to the Church to address this issue [Breitbart]. A good example of Narcolimosnas is when Mexican drug lord Javier Torres built a Catholic church in Culiacan, Sinaloa, Mexico [Borderzine]. Sinaloa? Yes, the headquarters of the dreaded Sinaloa Cartel, the same cartel that expanded operations to the Philippines in as early as 2013 [TP: 400 deaths]. And what does any multinational company do when it expands overseas? Adopt best practices from its headquarters. Does the Roman Catholic Church in the Philippines or other major religious groups receive donations from drug lords? I cannot definitively say for now. However, the Diocese of Parañaque’s rabid opposition to the drug war (as evidenced by its morbid outdoor exhibit outside the Baclaran Church [ABS]) despite the lack of relevant evidence showing state-sponsored killings [TP: Destroy Duterte], should raise some suspicion. Moreover, the fact that its head, Bishop Jesse Mercado [CBCP], has an alleged history of swindling disaster relief funds [Catholic], brings that suspicion to a whole new level. … and the Liberal Party. I have reason to believe that many Liberal Party (LP) members fall into this category, as evidenced by the late Quezon Governor Rafael Nantes of Quezon, who alleged ran a drug transshipment point in his province [TP: Jesse Robredo]. Nantes was LP’s national treasurer during the 2010 Presidential Campaign, where LP bet Benigno “Noynoy” Aquino won. Drugs flourished during LP’s occupation of Malacañang. Despite the rising drug problem, Aquino never mentioned it in any of his SONA speeches [TP: Aquino’s Priorities]. Besides, LP’s alleged links with the illegal drug trade is not really news, as I have explained in the July TP article “PNP Generals and PH Narcopolitics: Jesse Robredo’s murder holds key?”. In 2012, Justice Sec. De Lima even issued new rules to immediately release drug suspects while their cases are under automatic review [Star]. A willful ignorance of the drug problem and preferential treatment for drug offenders: this best describes the Aquino Presidency’s stance on illegal drugs. And did I mention that Ozamis’ politician-druglords – the Parojinogs – are connected not only to the Liberal Party [Star] but also to the illegal drug trade [Inq]? No wonder Sen. Grace Poe recently demanded that Sen. De Lima (LP) explain why drugs flourished during the latter’s DOJ stint [GMA]. It’s also interesting to note that today’s Commission on Human Rights Chair Chito Gascon was LP’s Director-General from 2009 to 2011. According to his LinkedIn Profile, he was “running [the] day to day affairs” of his party [LinkedIn]. Gascon has to be monumentally imbecilic if he didn’t know that his own treasurer could be a drug lord. But in spite of my disgust for Gascon, I would still concede that he is far from stupid. And let’s just be honest here: Duterte’s pro-poor policies have been torturing the Liberal Party since Day One [TP: Chef Duterte]. “Ibigay ko ito sa Armed Forces. Ito ang problema natin... I'm just saying that the ultimate warriors of the Constitution, to protect the people is the Armed Forces of the Philippines. So bahala na kayo… If it would outlast me, mawala ako nang bigla, hingin ko lang sa inyo to see to it that this country will not take a spin [GMA]”. Duterte said this in front of the AFP. He never said this in front of VP Leni Robredo of the Liberal Party, the woman who would take over his position should he prematurely lose the presidency. Yes, it appears that Duterte finds a post-Duterte military junta more tolerable than another Liberal Party Presidency. I guess we have a pretty good idea why. First, there was “Plan B”, which Duterte thwarted through Mark Villar’s appointment [TP: Villar]. Second, there was “Plan ICC”, which was made unlikely because of ICC’s weakening per the withdrawal of South Africa [NPR], potentially followed by a mass withdrawal of other African states [NewsWeek]. Third, there was US intervention , which was made unlikely because Loida Nicolas-Lewis’ LP-leaning US-Philippine Society is too closely connected to Hillary Clinton who, in turn, lost the November elections [TP: Trump]. And just when I thought that LP has ran out of tricks up their sleeve, here they go again with yet another plan, a plan that may actually work if we, the Filipino People, do nothing. But first, let’s talk about what this new plan could be, a plan that I shall call “Plan Q1 2017”. There’s nothing special about this name, except for the indication that whatever that plan is, it should be put into effect in the First Quarter of 2017 for reasons that I shall disclose later in the article. Sen. Leila de Lima who serves as the lightning rod and whose pronouncements against alleged extrajudicial killings sparked international outrage that would make Duterte’s ouster more palatable for the international community. The Liberal Party hierarchy provides the basic political machinery. LP can take care of all the ancillary support mechanisms during the ouster attempts, including grassroots mobilization. In the event of an ouster via People Power, VP Leni Robredo can legally serve as Duterte’s replacement, in light of the Supreme Court decision on Estrada v. Desierto [GR 146710-15] and/or Lawyers' League v. Aquino [GR 73748], where the High Court essentially recognized People Power as a legitimate method for removing a sitting president. Now that we have the ingredients, it’s time to talk about the recipe. That is, let me explain to you how it exactly works. How would these main players interact? How will they effect an overthrow? Let’s talk about that in the next article to be released later tonight.